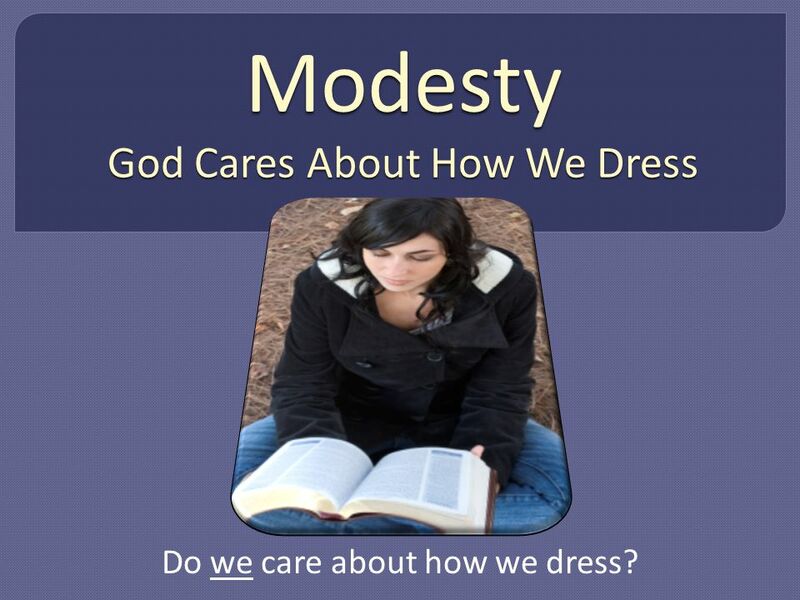 Modesty God Cares About How We Dress Do we care about how we dress? 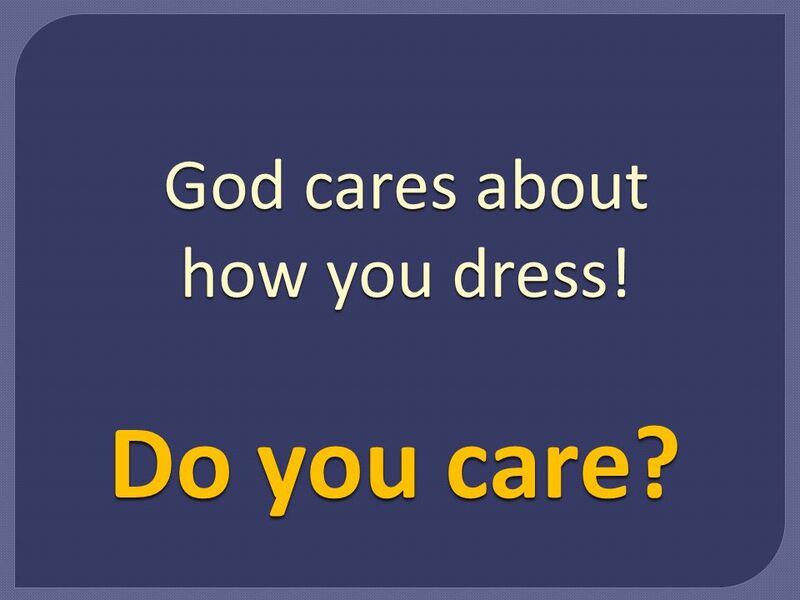 2 Modesty God Cares About How We Dress Do we care about how we dress? 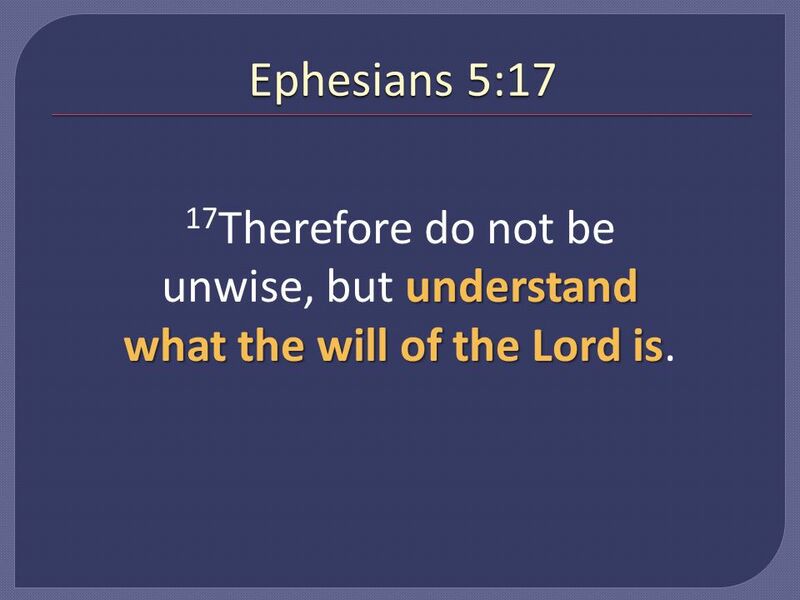 3 Ephesians 5:17 understand what the will of the Lord is 17 Therefore do not be unwise, but understand what the will of the Lord is. 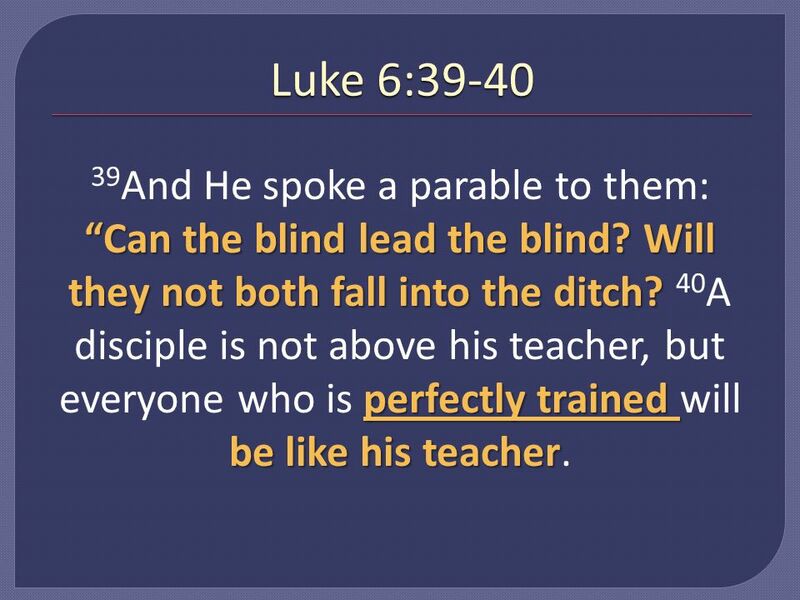 4 Luke 6:39-40 Can the blind lead the blind? Will they not both fall into the ditch? perfectly trained be like his teacher 39 And He spoke a parable to them: Can the blind lead the blind? Will they not both fall into the ditch? 40 A disciple is not above his teacher, but everyone who is perfectly trained will be like his teacher. 5 2 Timothy 2:15 does not need to be ashamed rightly dividing the word of truth 15 Be diligent to present yourself approved to God, a worker who does not need to be ashamed, rightly dividing the word of truth. 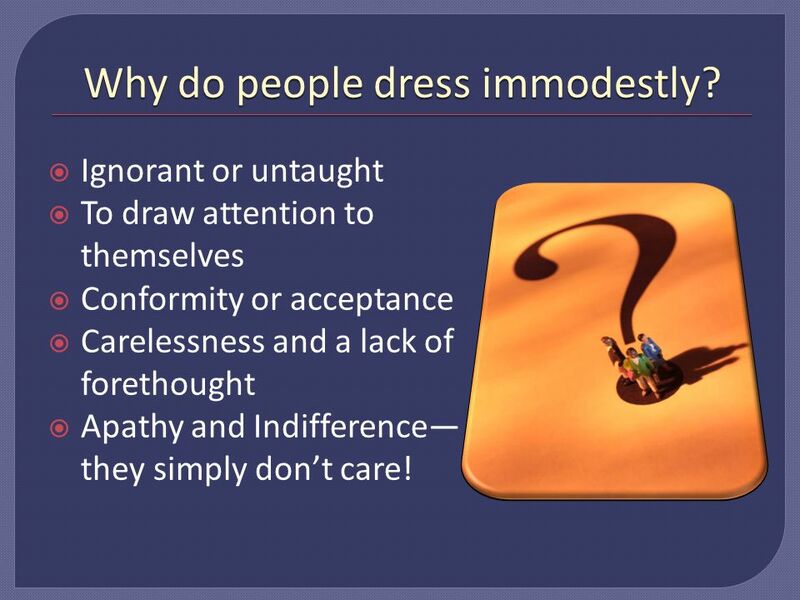 6 Why do people dress immodestly? Ignorant or untaught To draw attention to themselves Conformity or acceptance Carelessness and a lack of forethought Apathy and Indifference they simply dont care! 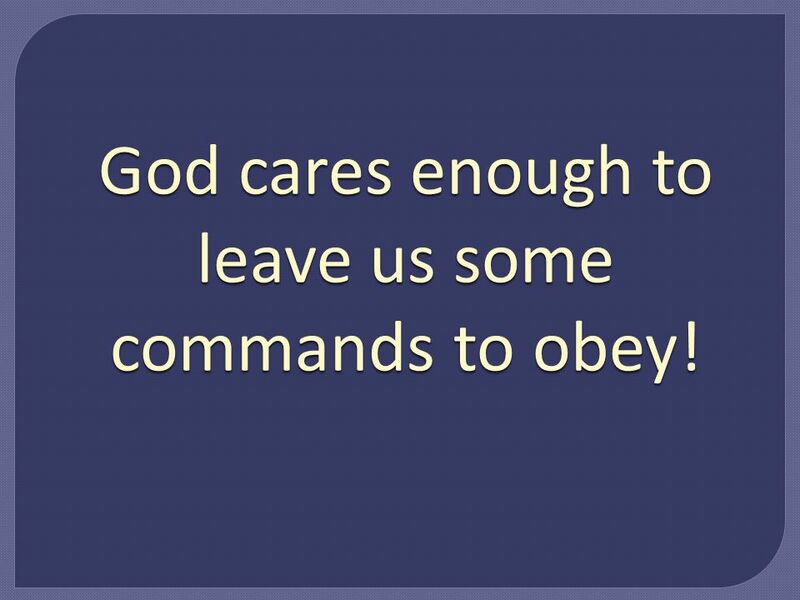 7 God cares enough to leave us some commands to obey! 8 1 Peter 3:1-7 chaste conduct putting on fine apparel gentle and quiet spirit in former times, the holy women who trusted in God also adorned themselves 7 Husbands, likewise 1 Wives, likewise, be submissive to your own husbands, that even if some do not obey the word, they, without a word, may be won by the conduct of their wives, 2 when they observe your chaste conduct accompanied by fear. 3 Do not let your adornment be merely outwardarranging the hair, wearing gold, or putting on fine apparel 4 rather let it be the hidden person of the heart, with the incorruptible beauty of a gentle and quiet spirit, which is very precious in the sight of God. 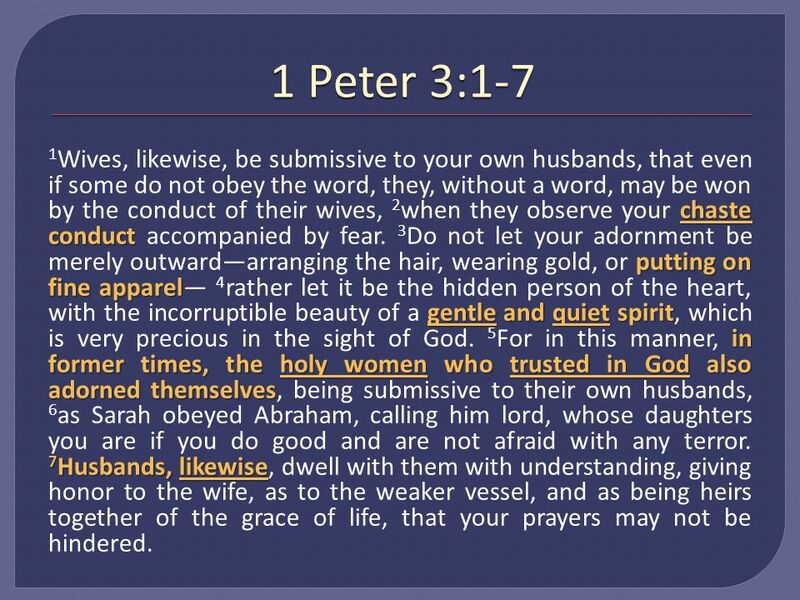 5 For in this manner, in former times, the holy women who trusted in God also adorned themselves, being submissive to their own husbands, 6 as Sarah obeyed Abraham, calling him lord, whose daughters you are if you do good and are not afraid with any terror. 7 Husbands, likewise, dwell with them with understanding, giving honor to the wife, as to the weaker vessel, and as being heirs together of the grace of life, that your prayers may not be hindered. 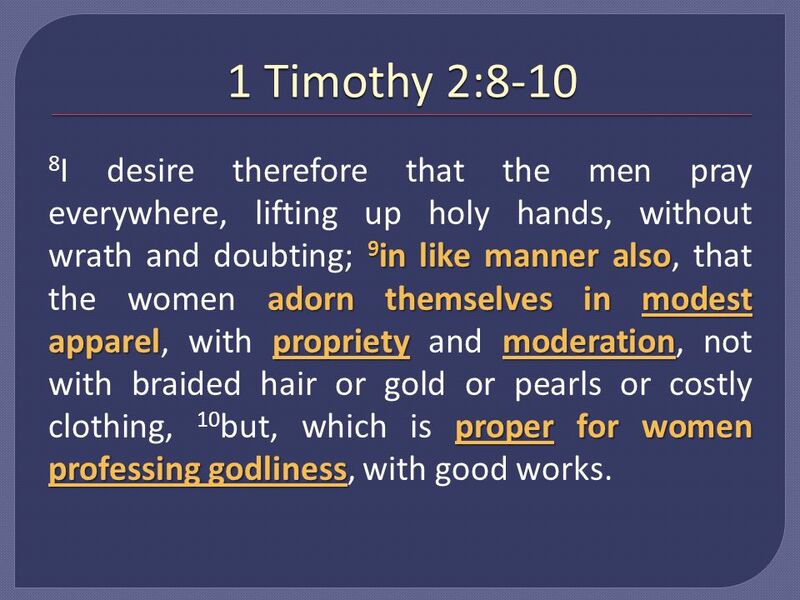 9 1 Timothy 2:8-10 9 in like manner also adorn themselves in modest apparelpropriety moderation proper for women professing godliness 8 I desire therefore that the men pray everywhere, lifting up holy hands, without wrath and doubting; 9 in like manner also, that the women adorn themselves in modest apparel, with propriety and moderation, not with braided hair or gold or pearls or costly clothing, 10 but, which is proper for women professing godliness, with good works. 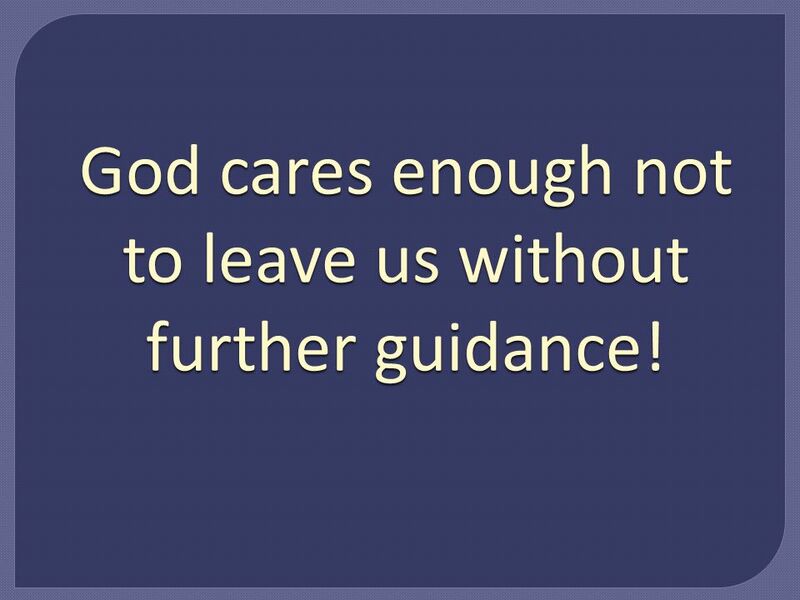 10 God cares enough not to leave us without further guidance! 11 A Controversial Subject? 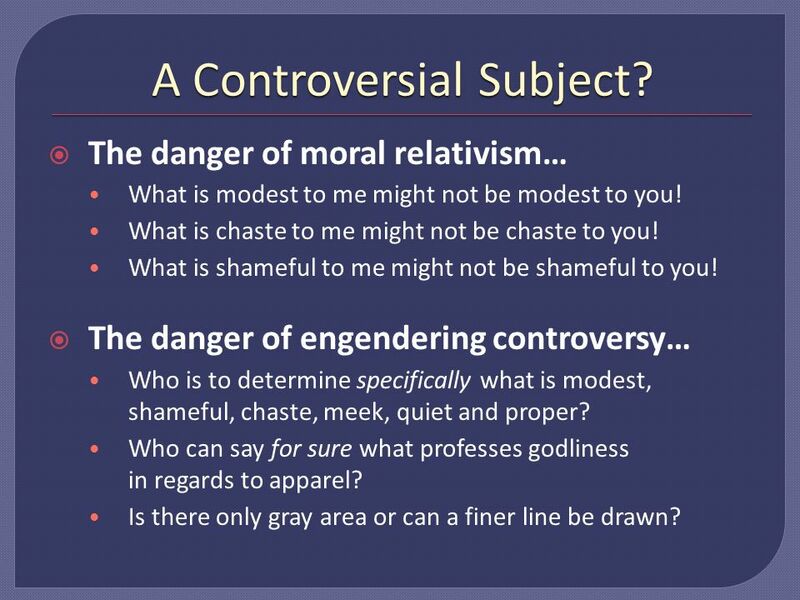 The danger of moral relativism… What is modest to me might not be modest to you! What is chaste to me might not be chaste to you! What is shameful to me might not be shameful to you! The danger of engendering controversy… Who is to determine specifically what is modest, shameful, chaste, meek, quiet and proper? Who can say for sure what professes godliness in regards to apparel? Is there only gray area or can a finer line be drawn? 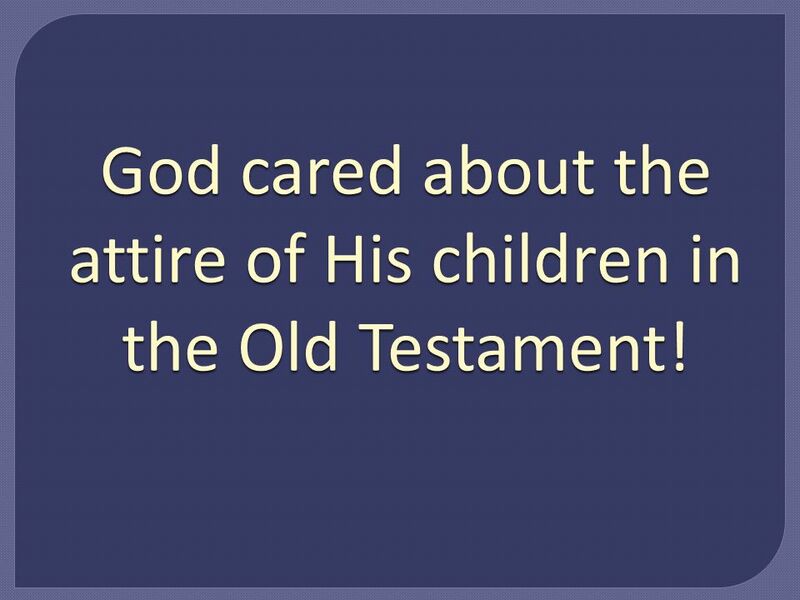 13 God cared about the attire of His children in the Old Testament! 16 God cared about how Adam and Eve dressed! 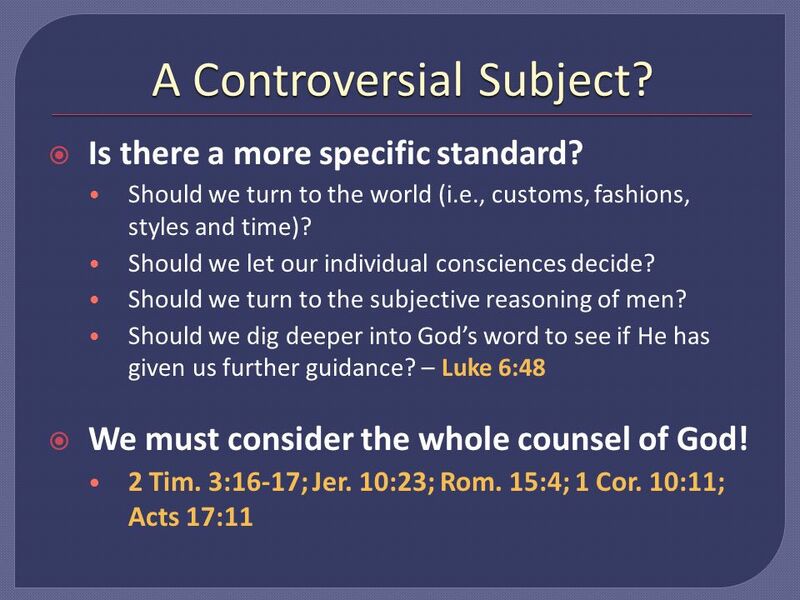 What does God consider CLOTHED? 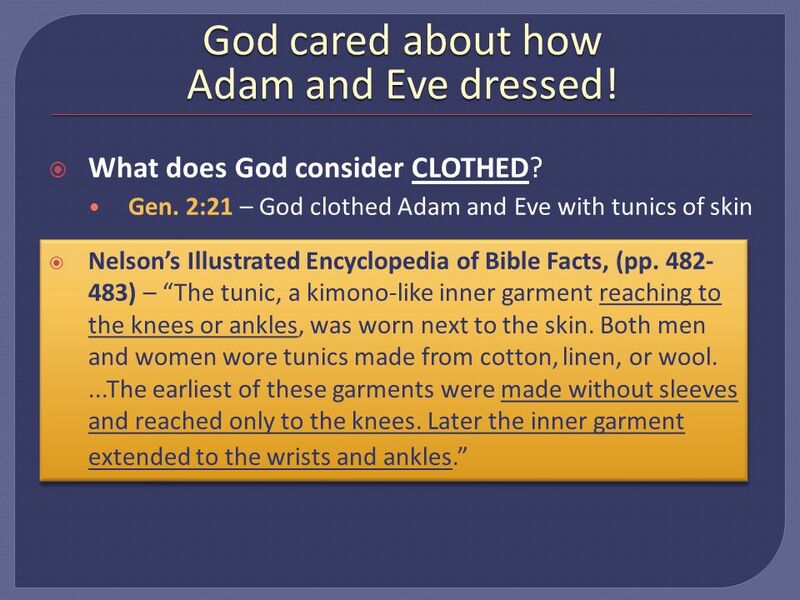 Gen. 2:21 – God clothed Adam and Eve with tunics of skin Nelsons Illustrated Encyclopedia of Bible Facts, (pp. 482- 483) – The tunic, a kimono-like inner garment reaching to the knees or ankles, was worn next to the skin. Both men and women wore tunics made from cotton, linen, or wool....The earliest of these garments were made without sleeves and reached only to the knees. Later the inner garment extended to the wrists and ankles. 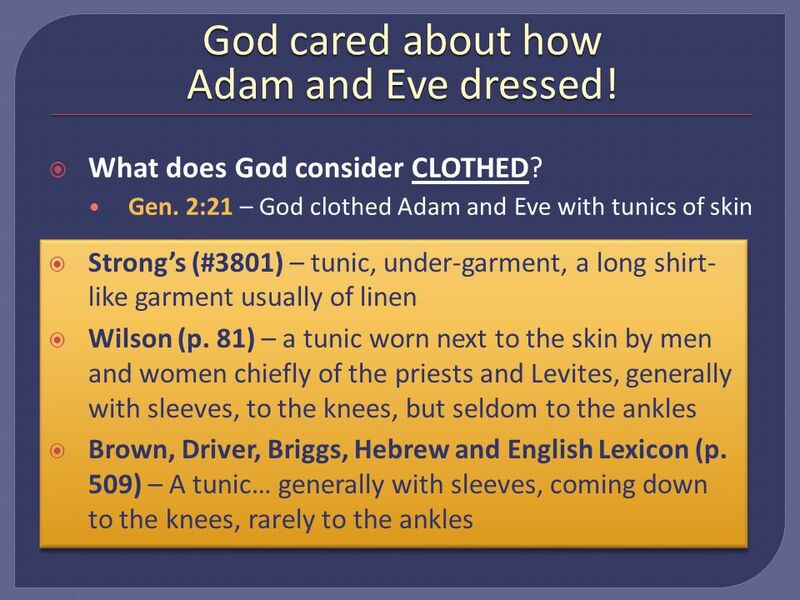 17 God cared about how Adam and Eve dressed! What does God consider CLOTHED? 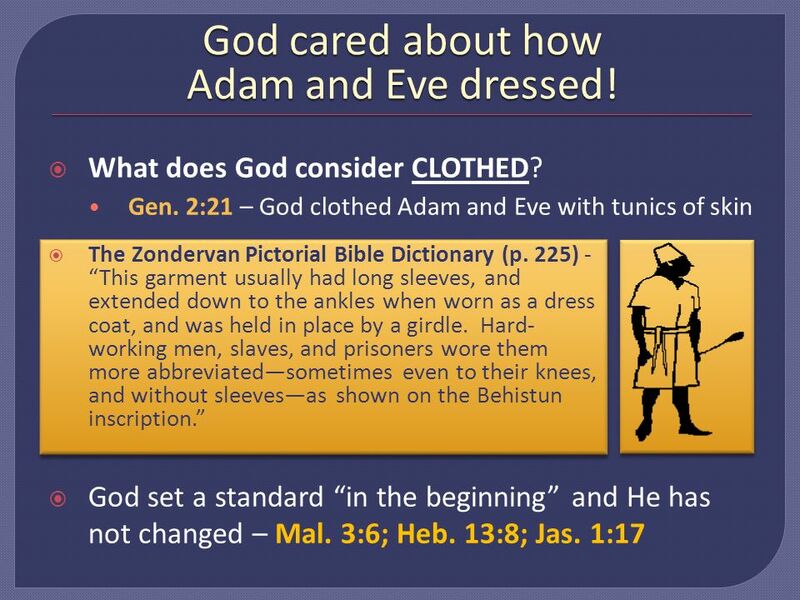 Gen. 2:21 – God clothed Adam and Eve with tunics of skin God set a standard in the beginning and He has not changed – Mal. 3:6; Heb. 13:8; Jas. 1:17 The Zondervan Pictorial Bible Dictionary (p. 225) - This garment usually had long sleeves, and extended down to the ankles when worn as a dress coat, and was held in place by a girdle. Hard- working men, slaves, and prisoners wore them more abbreviatedsometimes even to their knees, and without sleevesas shown on the Behistun inscription. 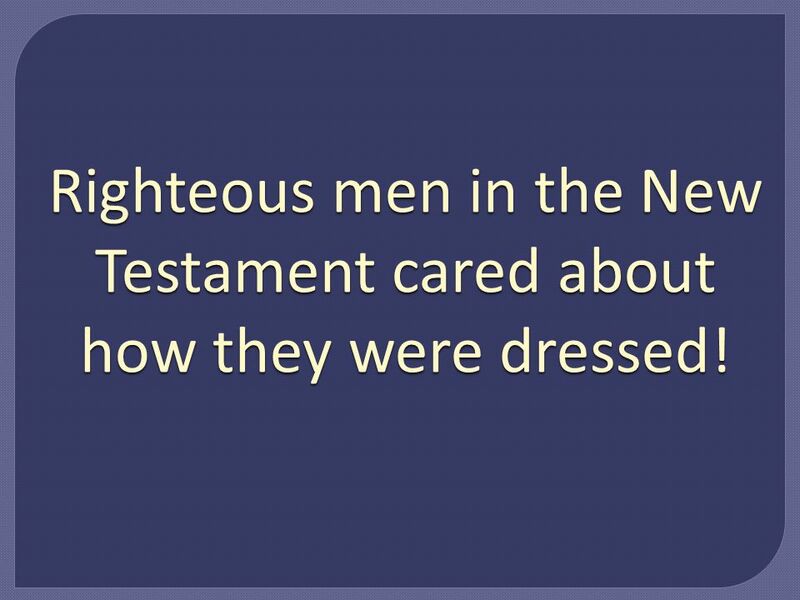 20 Righteous men in the New Testament cared about how they were dressed! 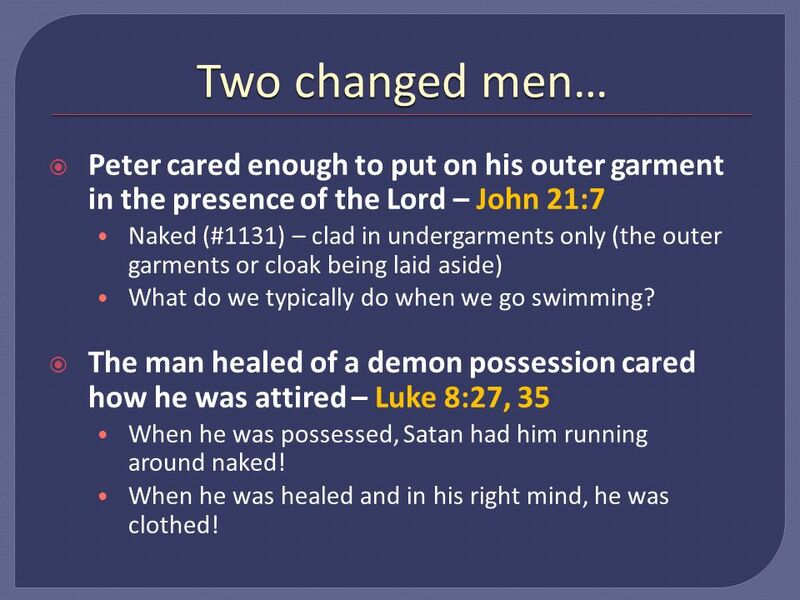 21 Two changed men… Peter cared enough to put on his outer garment in the presence of the Lord – John 21:7 Naked (#1131) – clad in undergarments only (the outer garments or cloak being laid aside) What do we typically do when we go swimming? The man healed of a demon possession cared how he was attired – Luke 8:27, 35 When he was possessed, Satan had him running around naked! When he was healed and in his right mind, he was clothed! 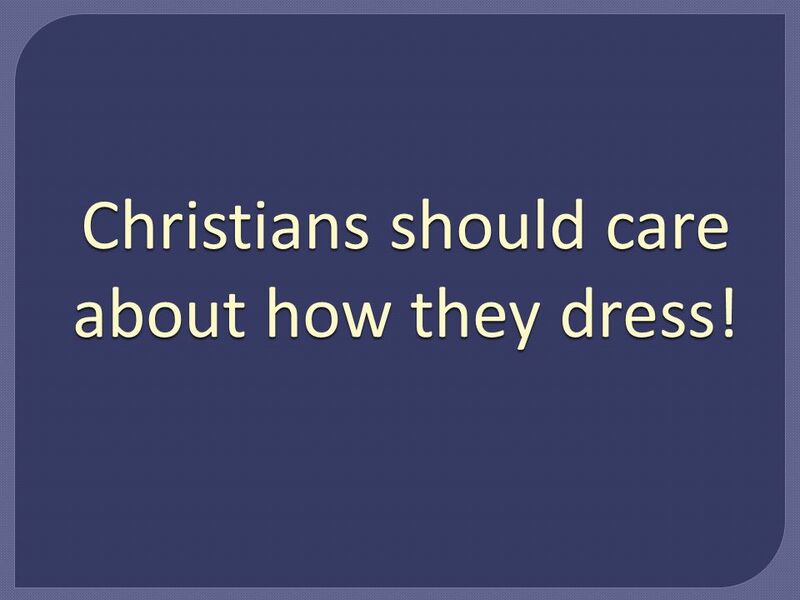 22 Christians should care about how they dress! 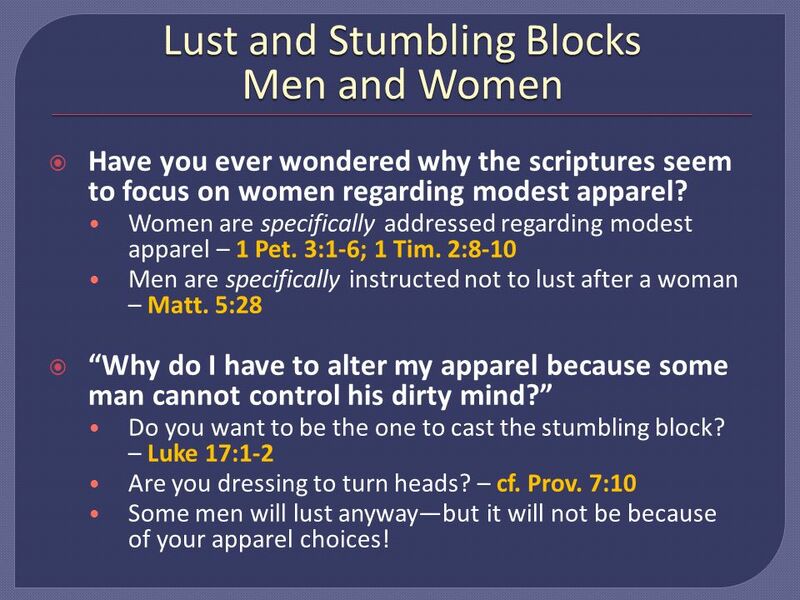 23 Lust and Stumbling Blocks Men and Women Have you ever wondered why the scriptures seem to focus on women regarding modest apparel? Women are specifically addressed regarding modest apparel – 1 Pet. 3:1-6; 1 Tim. 2:8-10 Men are specifically instructed not to lust after a woman – Matt. 5:28 Why do I have to alter my apparel because some man cannot control his dirty mind? Do you want to be the one to cast the stumbling block? – Luke 17:1-2 Are you dressing to turn heads? – cf. Prov. 7:10 Some men will lust anywaybut it will not be because of your apparel choices! 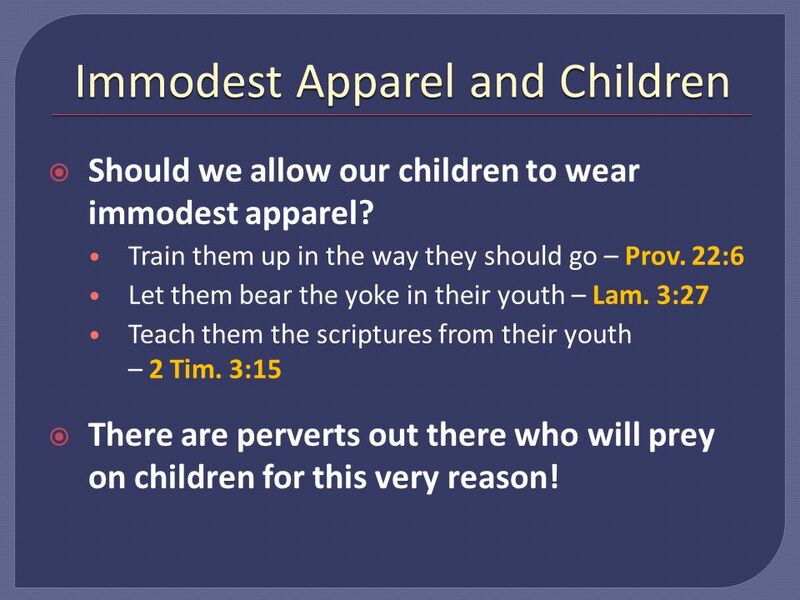 24 Immodest Apparel and Children Should we allow our children to wear immodest apparel? Train them up in the way they should go – Prov. 22:6 Let them bear the yoke in their youth – Lam. 3:27 Teach them the scriptures from their youth – 2 Tim. 3:15 There are perverts out there who will prey on children for this very reason! 25 Is immodest clothing always immodest? Can immodest clothing be acceptable in certain circumstances? Sports? Work? Weddings? Everyone else is wearing it? 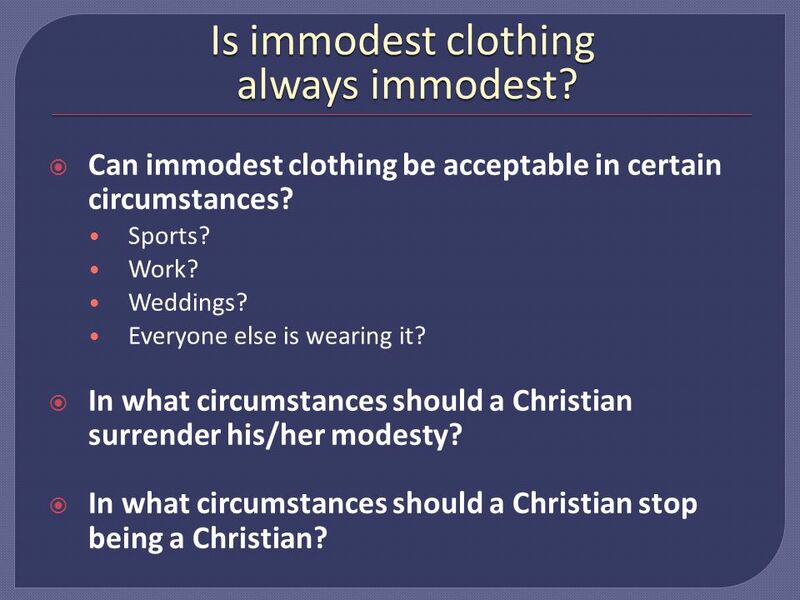 In what circumstances should a Christian surrender his/her modesty? In what circumstances should a Christian stop being a Christian? 27 God cares about how you dress! Do you care? 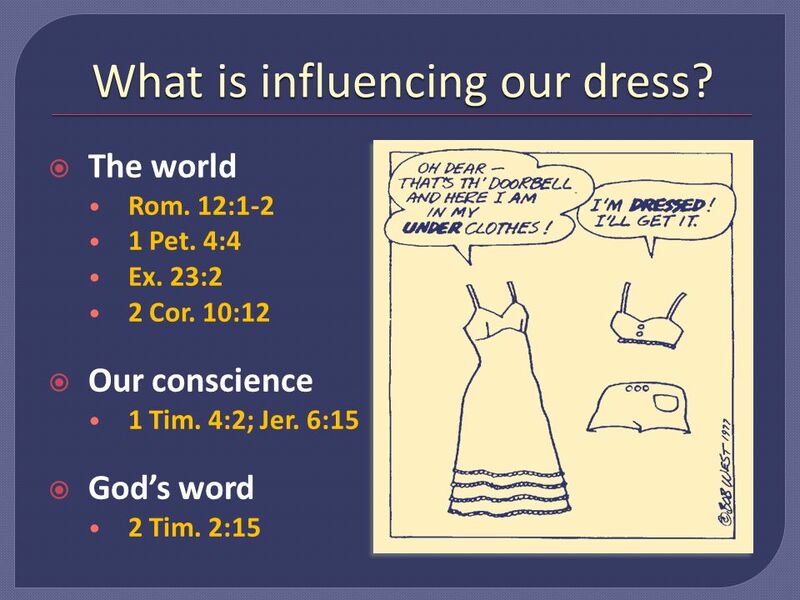 Download ppt "Modesty God Cares About How We Dress Do we care about how we dress?" 1 Peter 3:1-7 Better Husbands Better Husbands & Better Wives & Better Wives. Modesty. What is principle? 1. 1.A basic generalization that is accepted as true and that can be used as a basis for reasoning or conduct (Word Web). Gods Instruction Touches Every Aspect of Our Lives n Matthew 28:20 - "teaching them to observe all things that I have commanded you; and lo, I am with. Can a man swim in a swimming pool without a shirt, or a girl with just a swimsuit? Part 2. Modestly Dressed Biblical Instructions and Godly Suggestions. A Woman of Beauty 1 Peter 3:1-4. The world is spending Billions of dollars a year in an attempt to discover beauty. Tons of make-up are manufactured each. Let My Eyes Help My Heart. Eyes: whatever allows thoughts to enter our hearts. EYES  Matt 6:22-23, “The lamp of the body is the eye. If therefore your. To 160 th Ave Church of Christ. 1 Tim. 2: Likewise, I want women to adorn themselves with proper clothing, modestly and discreetly, not with braided. Let My Eyes Help My Heart Matthew 6: EYES: whatever allows thoughts to enter our hearts. EYES, HEARTS and CONDUCT  Job 31:7-8, “If my step has. Let My Eyes Help My Heart Matthew 6: EYES: whatever allows thoughts to enter our hearts (seeing, hearing, touching) EYES, HEARTS and CONDUCT  Job. THE SHAME OF NAKEDNESS. I. DANGER OF ACQUIRED CALLOUSNESS A. Failure to blush when ought to, Jer. 6:16 A. Failure to blush when ought to, Jer. 6:16. Genesis And the Lord God said, It is not good that the man should be alone; 1 Corinthians But I would have you know, that the head of every. What do these numbers represent? 5-6 & 12+ Does 1 Timothy 2:9, 10 clarify? Number of times modest dress has been preached. In the World, but Not of the World… Having a Heart of Modesty. Www.HebronChurchOfChrist.com. What do these numbers represent? 5-6 & 12+ Does 1 Timothy 2:9, 10 clarify? Number of times modest dress has been preached.